The DP63100 analog process panel meter offers many features and performance capabilities to suit a wide range of industrial applications. The DP63100 has a universal input to handle various input signals including DC voltage/current, process, resistance, strain and temperature. The optional plug-in output cards allow the opportunity to configure the meter for present applications, while providing easy upgrades for future needs. The DP63100 employs a dual line, tri-color display with a large 18 mm (0.71"), tri-color 6 digit top display line and a 8.9 mm (0.35"), 9 digit green bottom display line. 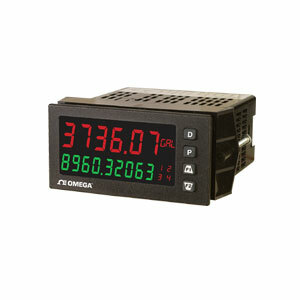 The meter provides a MAX and MIN reading memory with programmable capture time. The capture time is used to prevent detection of false max or min readings which may occur during start-up or unusual process events.The signal totalizer (integrator) can be used to compute a time-input product. This can be used to provide a readout of totalized flow or calculate service intervals of motors, pumps, etc. The meter has up to four setpoint outputs, implemented on plug-in option cards. The plug-in cards provide dual FORM-C relays, quad FORM-A, or either quad sinking or quad sourcing open collector logic outputs. The setpoint alarms can be configured to suit a variety of control and alarm requirements. Communication and bus capabilities are also available as option cards. These include RS232 and RS485. The DP63100 can be programmed to utilize MODBUS® protocol. With MODBUS, the user has access to most configuration parameters. Readout values and setpoint alarm values can be controlled through the bus. Additionally, the meter has a feature that allows a remote computer to directly control the outputs of the meter. The DP63100 includes a built-in USB programming port. With a Windows® based program, configuration data can be downloaded to the unit without the need of any additional option cards. A linear DC output signal is available as an optional plug-in card. The card provides either 20 mA or 10V signals. The output can be scaled independent of the input range and can track either the input, totalizer, max or min readings. The meter has been specifically designed for harsh industrial environments. With NEMA 4X (IP65) sealed bezel and extensive testing of noise effects and CE requirements, the meter provides a tough reliable application solution. Construction: This unit is rated for NEMA 4X (IP65) outdoor use IP20 touch safe. Installation Category II, pollution degree 2. One piece bezel/case. Flame resistant. Synthetic rubber keypad. Panel gasket and mounting clip included. Adding option cards to meters can be fitted with up to three optional plug-in cards. However, only one card from each function type can be installed at a time. The function types include Setpoint Alarms, Communications, and Analog Output. The cards can be installed initially or at a later date. Each optional plug-in card is shipped with installation and programming instructions.